Stink Bugs are members of the True Bug Order, also called “plant bugs.” Stink Bugs can congregate around buildings, in high populations becoming a major nuisance. They get their name from a pungent odor they release when handled, crushed or disturbed. There are over 200 Species found in the United States. Stink bugs can do damage to trees, shrubs, flowers, vegetables, fruit on fruit trees and they are a major agricultural pest. They are mostly herbivores and have piercing and sucking mouthparts. They feed by piercing plant parts, injecting digestive enzymes, and removing fluids by sucking them out like a spider. 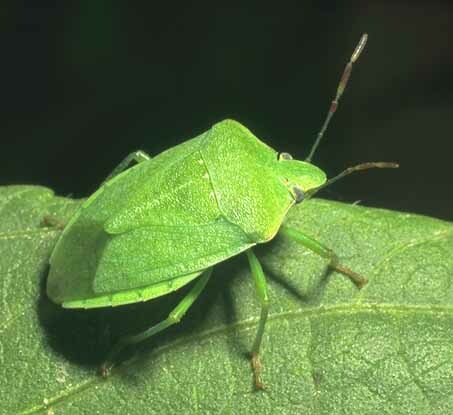 Large infestations of stink bugs may cause plants (especially small plants and young tender growth) to wilt, become stunted and misshapen, and/or die. Other damage includes yellow or white blotches on leaves; misshapen or aborted fruits, seeds, and buds; calluses, blemishes or depressions; and black pits on nuts. Tomatoes exhibit pale yellow spots and a white pithy area just under the skin at the puncture site. Peaches and other fruits may develop scarring and dimpling resulting in cat-facing or a pitted appearance. The seeds in soybean pods may be deformed, small, discolored, or shriveled. Stink bugs overwinter in protected areas under dead weeds, leaf litter, or the bark of trees; they emerge as temperatures rise in the spring. The females begin laying clusters of eggs on the undersides of leaves and she will continue to lay eggs throughout the season. These eggs are barrel or keg-shaped with a circular lid. 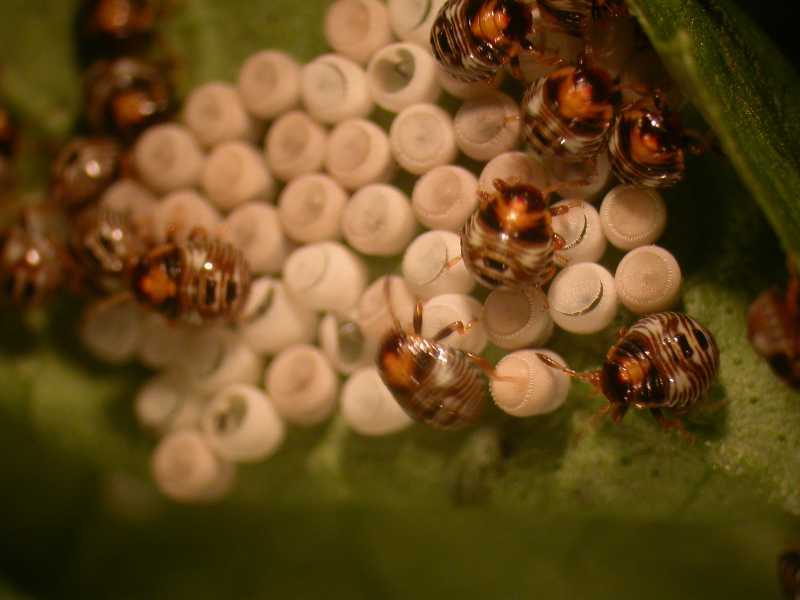 The eggs hatch into wingless nymphs that resemble small adult stink bugs, although the coloration may differ from that of the adult. The nymphs will go through up to six stages to become adults with wings. A couple of tips to help in controlling stink bugs. First, use Hi Yield Spreader Sticker with chemical sprays, this helps the chemical to adhere to the waxy shell of the insect and helps increase the length of the residue. Second, they feed and hide in weeds, so spray those areas well and repeat as needed. Hi-Yield 38 Plus is the strongest product available for homeowners and leaves the longest residue. Do Not Spray on vegetables. Use Hi-Yield Indoor\Outdoor Insect spray for insects that enter the home, spray around windows and doors. Fertilome Triple Action is made with Neem Oil and will kill all stages of the insect including the eggs, nymphs and adults. Beware of burning plants during hot weather and Do Not add spreader sticker since it is a non-chemical oil product. Bonide Stink Bug Traps have a dual action lure and work for indoor and outdoor use. They are odorless and non-toxic. Place the trap at lest 10 feet away from the garden to draw the bugs away from your plants. 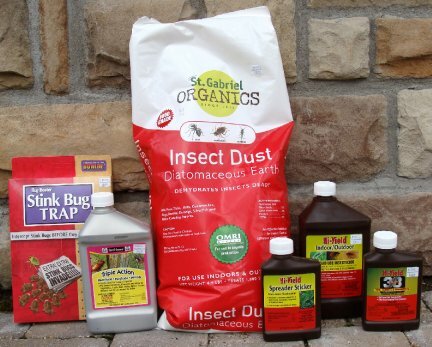 Diatomaceous Earth dust is a natural product that can be used indoors and out. Insects will dehydrate when they come in contact with the dust. It covers a wide range of crawling insects. Control weeds in and around areas of concern to decrease breeding and overwintering habitat. Remove weeds early in the growing season before stink bug populations increase or the loss of habitat may encourage pests to move into the garden. Hand pick and destroy eggs and bugs. Encourage other natural predators such as parasitic wasps and flies by growing small-flowered plants. 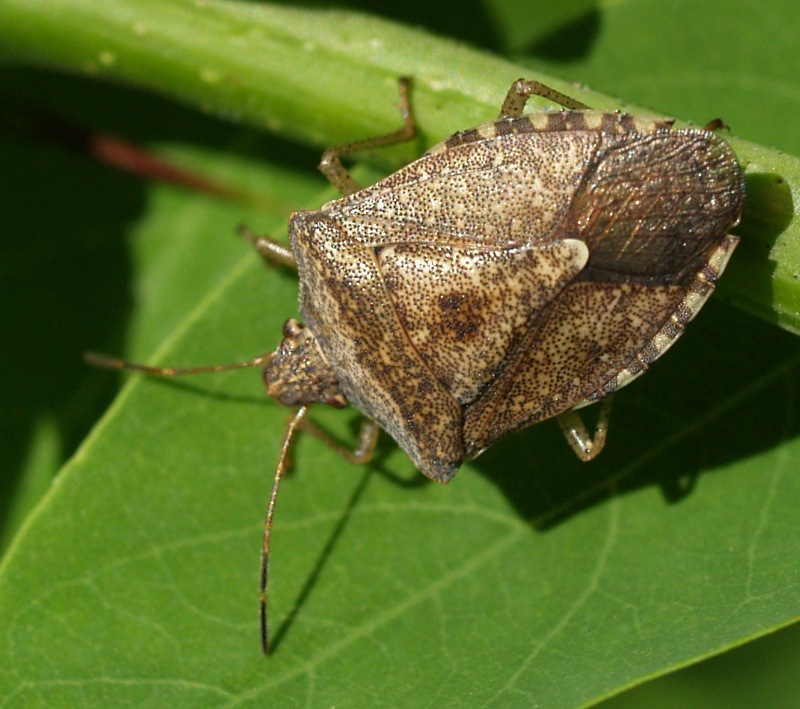 The unpleasant odor produced by stink bugs deters many predators but several bird species do consume these pests. Plant trap crops of mustard and treat that area with an appropriate pesticide.